– and, campaigning and taking direct action. But another way is to buy Palestinian products. 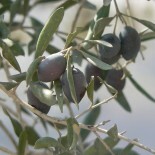 This helps the Palestinian economy and in many cases supports suppliers working with ‘fair trade’ principles – ensuring that the individual farmers, craftspeople and manufacturers in Palestine or in Palestinian refugee camps throughout the Middle East receive a decent wage and the dignity that goes with properly respected and remunerated work. This website lists places in the Edinburgh area where you can buy Palestinian products of all kinds – olive oil to crafts, soap to couscous. If you know of a new stockist which needs adding, or if there is information on the site which you think needs amending, please get in touch. Dig in Bruntsfield here…..your local community owned greengrocer! We have been open since May 2014, and have been stocking your produce since Day 1, which we purchase wholesale from Green City. We currently have in the shop ( head to the back section ). Olive oil, almonds, Maftoul, couscous, za ‘ tar, freekeh.